US president Donald Trump has disbanded two corporate councils after even more executives left in a move to distance themselves from his handling of Charlottesville. President Donald Trump made the announcement on Twitter after the heads of 3M, Campbell Soup, Johnson & Johnson, and United Technologies announced their resignations, the BBC reported. The chief executives left after Trump backtracked his belated condemnation of the white supremacist and neo-Nazi groups that rallied in Charlottesville, Virginia and instead blamed the left-wing counter protesters. 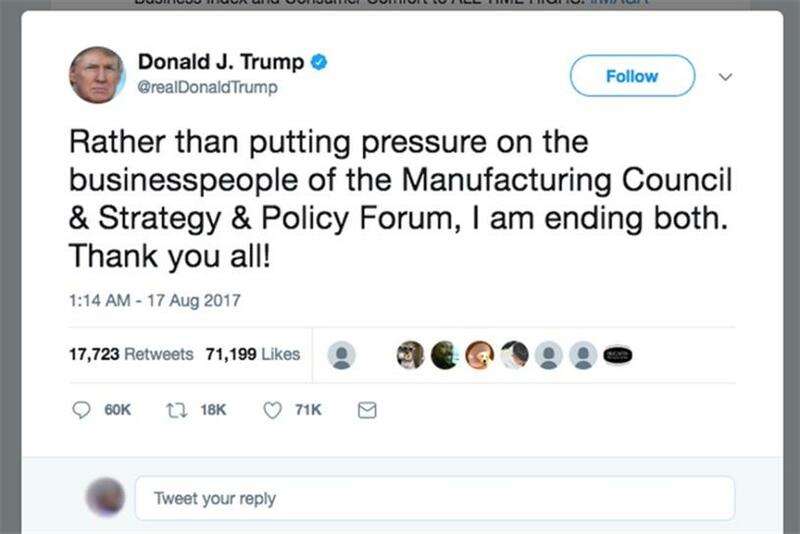 Trump's tweet read: "Rather than putting pressure on the businesspeople of the Manufacturing Council & Strategy & Policy Forum, I am ending both. Thank you all!" In a statement, around the time of the president's tweet, the Strategy and Policy Forum announced it was a joint decision to disband the council. Yesterday, PepsiCo's chief executive Indira Nooyi came under pressure from racial-justice group Color of Change to quit the business advisory council. This is after chief executives from Under Armour, Intel and pharmaceutical company Merck quit the council on Monday after the president took two days to officially condemn the white supremacists at Charlottesville. This article originally appeared in Campaign UK.